At today's Annual General Meeting (AGM) in Skandinaviska Enskilda Banken AB (publ) Johan H. Andresen, Signhild Arnegård Hansen, Samir Brikho, Winnie Fok, Sven Nyman, Jesper Ovesen, Helena Saxon, Johan Torgeby and Marcus Wallenberg were re-elected as Directors of the Board. Lars Ottersgård and Anne Berner were elected as new Directors of the Board. Anne Berner will take up the assignment on 1 June 2019. The AGM re-elected Marcus Wallenberg as Chair of the Board. 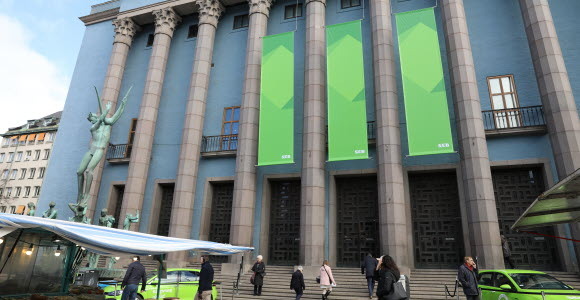 The AGM approved an ordinary dividend of SEK 6.00 (5.75) and an extraordinary dividend of SEK 0.50 per A and C share for 2018, and Thursday 28 March, 2019, as record date for the dividend. The Director's fee was set at SEK 10,240,000 in accordance with the Nomination Committee's proposal. The fee will be distributed as follows: SEK 3,100,000 to the Chair of the Board and SEK 7,140,000 to be distributed among other Directors elected by the AGM who are not employed by the Bank, with SEK 980,000 each to the Deputy Chairs and SEK 740,000 each to other Directors. In addition the fee for the committee work was set in accordance with the Nomination Committee's proposal: Risk and Capital Committee, SEK 600,000 to the Chair and SEK 375,000 to other member, Audit and Compliance Committee, SEK 425,000 to the Chair and SEK 265,000 to other member and Remuneration and Human Resources Committee, SEK 387,500 to the Chair and SEK 195,000 to other member. The AGM approved the Board of Director's proposal concerning remuneration principles to the Group Executive Committee. The principles comply with the Swedish Financial Supervisory Authority regulations as well as the Swedish Corporate Governance Code and are in line with international regulations. The AGM approved the Board of Director's proposal concerning one profit sharing programme for all employees except the Group Executive Committee, SEB All Employee Programme 2019, one SEB Share Deferral Programme 2019, comprising approximately 1,000 senior managers and key employees, and one SEB Restricted Share Programme 2019, comprising approximately 1,000 employees in certain business units. The AGM approved the Board of Director's proposal concerning the acquisition and sale of the Bank's own shares, for the securities business, for long-term equity programmes and for capital purposes as well as proposal for decision on authorization to the Board of Directors to issue convertibles. The AGM approved the Nomination Committee's proposal to elect Ernst & Young AB as auditor. Main responsible will be the authorised public accountant Hamish Mabon. The decisions can be read in full at www.sebgroup.com. At the statutory Board meeting following the AGM, Sven Nyman and Jesper Ovesen were appointed Vice Chairs of the Board. The members of the committees of the Board were also appointed and information of the composition of the committees is available at www.sebgroup.com. Also, in accordance with the decision by the AGM to authorize the Board to decide on the acquisition and sale of own shares for SEB's long-term equity-based programmes, the Board decided that a maximum of 50,600,000 shares of Class A may be acquired and sold. The transactions may take place at one or several occasions during the period until the Annual General Meeting in 2020. The acquisitions are intended to enable the Bank to transfer the acquired shares to participants in outstanding long-term equity-based programmes. When one or more participants in the programmes call for exercise the Bank will within the context of the Board's decision acquire shares to the extent necessary and immediately transfer them to the participant or participants. The repurchases shall exclusively take place on Nasdaq Stockholm at a price within the price interval at any time recorded and the transactions will be reported via Nasdaq Stockholm in accordance with prevailing rules. Furthermore, SEB's web site www.sebgroup.com/ir will be updated continuously.